Professor Agrawal is a researcher, writer, teacher, entrepreneur, business strategy advisor, and speaker. He is currently focused on the economics of machine intelligence. Ajay Agrawal is the Geoffrey Taber Chair in Entrepreneurship and Innovation and Professor of Strategic Management at the Rotman School of Management, University of Toronto. In addition, he is a Research Associate at the National Bureau of Economic Research in Cambridge, MA and Faculty Affiliate at the Vector Institute for Artificial Intelligence in Toronto, Canada. Professor Agrawal is founder of the Creative Destruction Lab (CDL), a not-for-profit program focused on helping founders transform science-based projects into massively-scalable and financeable businesses. The CDL is home to one of the greatest concentrations of AI-related startups of any program on Earth. Atomwise, Blue J Legal, BenchSci, Chisel, Deep Genomics, Eigen Innovations, Ecoation, North (previously Thalmic Labs), Kyndi, Automat AI, and Ada are sample graduates of the CDL. In addition, CDL was first in the world to launch a program dedicated to quantum machine learning (QML) startups, enabling 25 QML companies per year. CDL has programs specifically designed for machine intelligence applied to sectors such as health, energy, and space. CDL operates five programs across Canada as well as CDL-NYC at New York University and CDL-Oxford in the UK. Professor Agrawal is also co-founder of The Next 36, Next AI, and Next Founders, all not-for-profit programs designed to support the training and personal development of young entrepreneurs, many of whom are building companies predicated on machine intelligence. Professor Agrawal is co-founder and co-chair of two annual conferences on machine intelligence: “Machine Learning and the Market for Intelligence” [applied], and "The NBER Economics of Artificial Intelligence Conference" [scholarly]. Professor Agrawal is a co-author of the best-selling book "Prediction Machines: The Simple Economics of Artificial Intelligence." The book was named one of the top ten technology books of 2018 by Forbes and reviewed or cited in The New York Times, The Economist, Financial Times, Wall Street Journal, McKinsey Quarterly, Forbes, Bloomberg, Globe and Mail, Hindustan Times, The Irish Times, Fortune, San Francisco Review of Books, Fast Company, NPR Market Watch, C-SPAN, Foreign Policy, among other outlets. He is also co-author of a number of scholarly and popular press articles on the economics of machine intelligence. Professor Agrawal serves as Co-Chair of the Committee for Economic, Legal, and Regulatory Implications of Emerging Technologies: A Workshop Series, which is focused on the international (cross border) policy implications of machine intelligence and conducted under the auspices of the The National Academies of Sciences, Engineering, and Medicine in Washington, DC in cooperation with The Royal Society in London, UK. Professor Agrawal also serves on the Advisory Board of Carnegie Mellon University's Block Center for Technology and Society, which is focused on the future of work, the related issues of trust and transparency that arise when autonomous or semi-autonomous systems are used to support or make consequential decisions, and on using technology and analytics to develop innovative technology and policy solutions to these problems. Professor Agrawal is co-founder of Kindred, building intelligence for robots, and Sanctuary, building synths - beautiful machines with superhuman empathy. 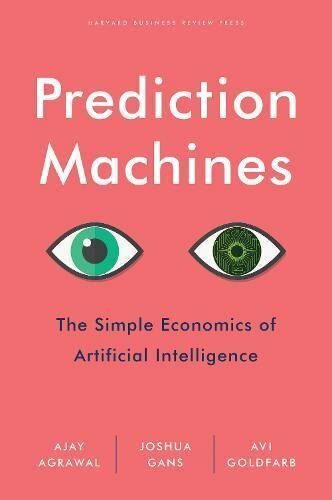 Prediction Machines Book: The Simple Economics of A.I. Professor Agrawal is an editor, along with Joshua Gans and Avi Goldfarb, of the scholarly book "The Economics of Artificial Intelligence: An Agenda," that sets the agenda for artificial intelligence research in economics. The NBER volume is forthcoming from the University of Chicago Press (anticipated publication in spring 2019). Draft chapters are here. Professor Agrawal was awarded Professor of the Year seven times by MBA classes at the Rotman School of Management, the Martin-Lang Award for Excellence in Teaching, and the Distinguished Scholarly Contribution Award (2017). The Globe and Mail named Professor Agrawal to its 2017 “Power 50” list of the most influential Canadians. The MIT Technology Review named Kindred, an intelligent robotics company co-founded by Professor Agrawal, to their list of The 50 Smartest Companies in the World (2017). CB Insights also included Kindred in their Ranking of the 100 most promising private artificial intelligence companies in the world, the AI 100 (2018).